A sinus lift or sinus augmentation is surgery that adds bone to the upper jaw in the area of your molars and premolars. In order to place the bone in this area, which is needed for dental implants to be placed, the sinus membrane is “lifted” or moved upward. This procedure is done when the upper jaw is lacking in bone, when the jaw is too close to the sinuses – all making it difficult to place dental implants. If you are missing teeth in the upper jaw of your mouth, for example, your back teeth or molars, you most likely will be lacking sufficient bone which is need for the placement of dental implants. Even with teeth, the back of the upper jaw typically has less bone than that of the lower jaw. Lack of bone in the upper jaw can also be due to periodontal / gum disease. Tooth loss causes bone loss in the jaw. When a tooth falls out, the body begins to “resorb” or absorb the bone back into the body. 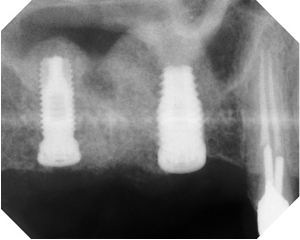 If the teeth have been missing for some time, there may not be enough bone left in the jaw to place dental implants. 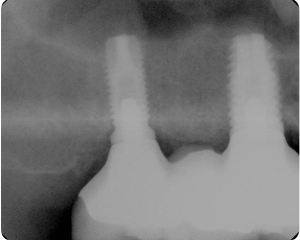 If the upper jaw is too close to the maxillary sinus, implants cannot be placed. Sinus shape and size vary from person to person. As you age, the sinus can get larger too. 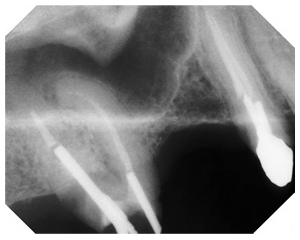 Dr. Fialkoff will place granules of bone-graft material into the space where the sinus was. While the amount of bone placed varies, usually several millimeters are added above the jaw. It will take several months for the material to harden and integrate with the jaw. 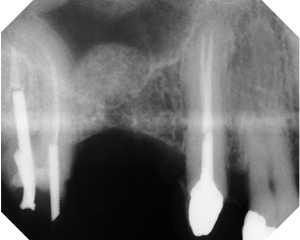 Usually, implants may be placed in four to nine months after sinus lift surgery. Final Result: A Beautiful & Natural Smile! Please note that these pictures are examples of results and that individual results may vary. No guarantee can be given as to the exact result.